Open Pressure: 200 lbs @ .475"
Does Edelbrock 5802 fit your vehicle? 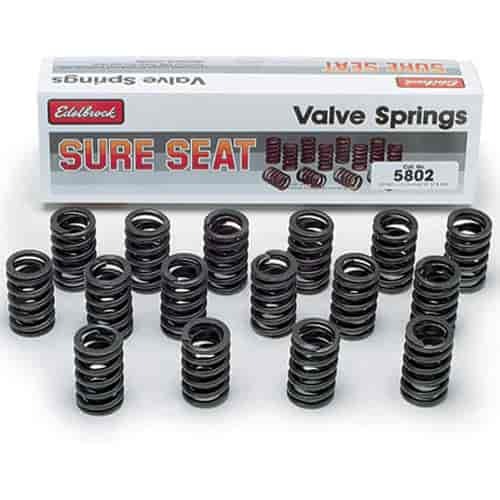 5802 - Edelbrock Sure Seat Valve Springs is rated 5.0 out of 5 by 1. Rated 5 out of 5 by RandyRi from Valve springs so far engine is running fine. Valve springs came quickly and appeared to be good. Yes, these will work with most GEN I small block chevy engines. I have Edelbrock 2102 camshaft to go w/ Performer 2701 intake in GEN I 350 SBC. I cannot find a complete kit for valve springs with retainers and keepers/locks. I need #5802 Valve Springs, &amp; 9721 Retainers, but what keeper/locks? Would these springs work good with a thumper cam w/ 479/465 lift 279/297 duration in a sbc?